For more than a century, SEMCOR has been dedicated to meeting the needs of its diverse client base with an extensive selection of material and fluid handling products. Count on us for all your piping needs — in addition to sales, we back up everything we sell with expert service and support. To learn more about our products, keep reading or contact our office directly for assistance. One of the reasons for our continued success is our longstanding commitment to solving problems for our customers. If we don’t have the ATL PTFE-lined pipe fitting or other product you’re looking for in stock, we may be able to fabricate an acceptable replacement. 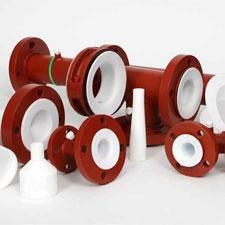 Use ATL PTFE-lined piping in any application where superior chemical resistance is required. Compared to other plastic pipe lining, ATL PTFE has been proven to reduce permeation rates by up to 60%. It is also far more resistant to corrosion and high temperatures, and it features a full vacuum rating up to 450°F. As a result, ATL PTFE-lined pipe and fittings are ideal for severe service applications, including pulp and paper processing, and power generation. Compared to exotic alloy materials or glass lining, ATL PTFE is an economical choice that gets the job done right. For detailed specifications and more information about potential applications, contact SEMCOR directly. ATL PTFE lining is a proprietary Resistoflex® product, one that was designed specifically to address the challenges of liquid handling in heavy industry. Since 1936, Resistoflex has been a noted innovator in piping technology. ATL PTFE lined pipe is one of their newest and most revolutionary products yet. SEMCOR is a longstanding Resistoflex dealer for the Midwest region — we know the company better than anyone and can help you choose the best product for your needs. We are dedicated to your satisfaction and success with the products we offer. The SEMCOR team is available by phone or email to answer all your questions related to Resistoflex ATL PTFE lined pipe and fittings. Contact a representative today for detailed product specifications and for more information about potential applications.